What's your favorite part of spring? Is there anything specific you'd like to cook/bake during the spring season? Many of you share the same sentiments as me about spring in that it brings a sense of freshness after the winter months. As for cooking and baking, I enjoy lighter fare and delicate flavors using fresh fruits and vegetables. We can't forget how many may be celebrating Easter in a few weeks too! And if you're an avid food blogger, you'll be happy to know that there will be more natural sunlight for great photo taking opportunities! However this week, a lucky ready won't have to worry about getting ample lighting for their pictures... especially with the Digital Concepts/Sakar lighting studio I'm giving away! So, who's the lucky reader that will be getting this?? 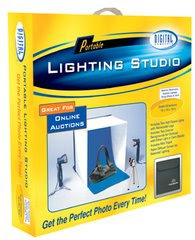 The PS-101 lighting studio helps produce great images that are professional quality. This package includes light and dark backgrounds for the best color contrasts. 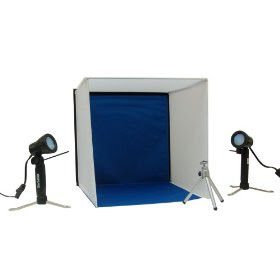 Be a professional with Digital Concepts portable lighting studio. I love the newness that spring brings. It's like a fresh start! Congratulations Stephanie! I hope you'll enjoy your new lighting studio for your blog! Please email me at [email protected] so I can confirm the mailing address in which to have your Digital Concepts/Sakar sent to. Thanks again to all those that commented and stay tuned to the next Foodie Freebie announcement on Monday,March 27, 2009! Next week someone is going to get some major pampering! Have a great weekend and hope you enjoy something delicious! Back to ebay for me! An amazing food related website any avid cook should visit is www.expendableedibles.com. It's everything you might want to keep in mind before tossing away perfectly good foods because they may have flaws, be nearly expired or a tad ughly - eg we've all had that dented apple or crubled up cookies. What a cool giveaway! Congrats to the winner! Your blog just popped into my google reader recommended feeds, and I'm so glad it did. Everything is so yummy! I can't wait to keep reading more!! !